Miss Universe 2015 Pia Wurtzbach really knows how to take it easy and just have some good old fun. She was spotted in Singapore with Filipino-Swiss racer Marlon Stockinger. In her Instagram account, Pia posted a photo together with Stockinger with the Singaporean skyline as their backdrop. Stockinger for his part earlier posted his dinner date with Pia. 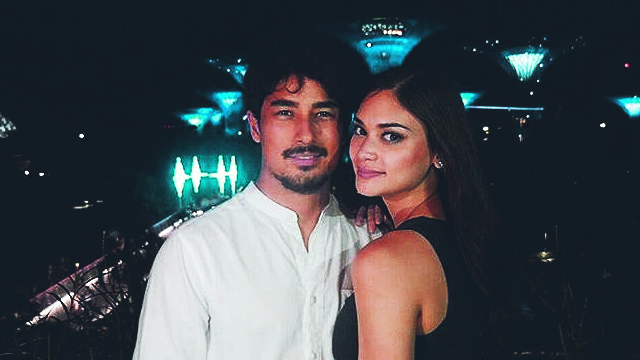 Stockinger initially denied in October that he and Pia were dating, saying they were only close friends. He then admitted to ABS-CBN later that month during the Star Magic Ball event that they were in fact an item. “The truth? Let’s put it this way if Pia was here tonight she’d be my date here. So yeah obviously we see each other but we just want to keep it down low pretty much. But yeah, I’ve been seeing Pia,” he said. Rumors that the two were in a romantic relationship started when Pia posted this picture with Stockinger in September. Prior to Stockinger, Pia previously dated Mikhail Varshavski, also known as the “Sexiest Doctor Alive,” but the two seemed to have had a falling out after a couple of months.